Lead, one of the EPA criteria pollutants, is a bluish-gray metal found in small quantities in the earth’s crust. Naturally occurring lead is rarely found as a metal in the environment; instead, it is usually found combined with two or more other elements in the form of lead compounds (ATSDR, 2007a). While lead itself does not break down in the environment, some lead compounds can be changed into other forms by sunlight, air, and water. Lead released into the air may travel for long distances before settling to the ground, where is usually binds strongly to soil particles (ATSDR, 2007b). Lead can accumulate in plants and animals from areas where air, water, or soil are contaminated with lead. If animals eat contaminated plants or other animals, most of the ingested lead will pass through their bodies (ATSDR, 2007a). Lead can be found in all parts of our environment, in part due to human activities. It is used in many different products, including batteries, ammunition, metal solder, and devices to shield x-rays. Due to health concerns, the use of lead in paints, pesticides, ceramic products, caulking, and pipe solder has been dramatically reduced. Lead (in the form of tetraethyl lead) was banned as a gasoline additive in 1996. Prior to this, most of the lead released into the environment in the U.S. came from vehicle exhaust (ATSDR, 2007a). As a result of increasingly stringent standards leading up to the ban on lead in gasoline, the level of lead in air decreased by 94% between 1980 and 1999 (EPA, 2012). Today, major sources of lead emissions into the air are ore and metal processing facilities, waste incinerators, utilities, lead-acid battery manufacturers, and piston engine aircraft operating on leaded aviation fuel. The highest air concentrations of lead are typically found near lead smelters (EPA, 2012). 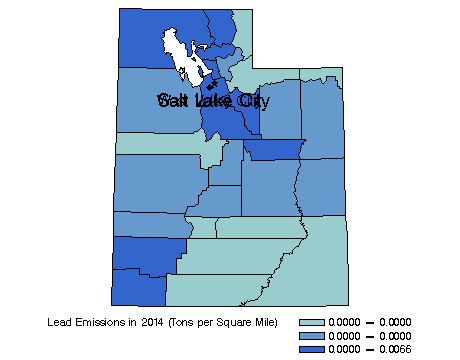 In 2014, over half of the lead released into the atmosphere in Utah came from mobile sources (Figure 1), nearly all of which was due to exhaust from aircraft using leaded aviation fuel (EPA, 2016d). Releases from industrial processes, particularly metal smelting and processing, were the second largest source of lead air emissions. A county level distribution of lead emissions is presented in Figure 2 (note that emission levels do not indicate air quality) (EPA, 2016d). Lead in the air can enter the body through the lungs, where it is quickly transported by the blood to other parts of the body. Larger lead-containing particles that are too large to enter deeply into the lungs can be coughed up and swallowed. Once lead enters the body, it travels to soft tissues such as the liver, kidneys, lungs, brain, spleen, muscles, and heart (ATSDR, 2007a). Within several weeks, approximately 99% of the lead taken into the body of an adult will be excreted in urine or feces. However, in children only 32% of lead will leave as waste, the rest remaining in the body. Most of the lead that has not been excreted will move to the bones and teeth, where it can stay for decades. In adults, 94% of the lead in the body is contained in those locations. In children, this number is 73% (ATSDR, 2007a). Lead can affect nearly every organ and system in the body. Depending on the level of exposure, lead can harm the nervous system, kidney function, immune system, reproductive and developmental systems, and the cardiovascular system. The lead effects most commonly encountered in current populations are neurological effects in children and cardiovascular effects (e.g., high blood pressure and heart disease) in adults (EPA, 2012). Long term exposure in adults can cause weakness in fingers, wrists, or ankles and decreased performance on some tests that measure nervous system function. Young children are among the most sensitive groups, and exposure can affect mental and physical growth (ATSDR, 2007b). Unborn children can be exposed to lead through their mothers. Harmful effects include adverse birth outcomes like premature births, smaller babies, reduced growth in young children, decreased mental abilities, and learning difficulties. While the harmful effects of lead are more common after exposure to high concentrations, the best available science indicates that there is no safe level of lead exposure, especially for children (ATSDR, 2007a). The primary and secondary National Ambient Air Quality Standards (NAAQS) for lead are 0.15 micrograms per cubic meter of air (µg/m3), based on a rolling three month average. This level was enacted in 2008, prior to which the primary standard was 1.5 µg/m3 (EPA, 2013d). 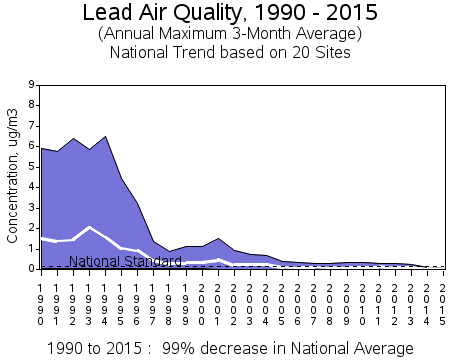 Nationally, lead levels in air have decreased by 99% between 1990 and 2015 (Figure 3). 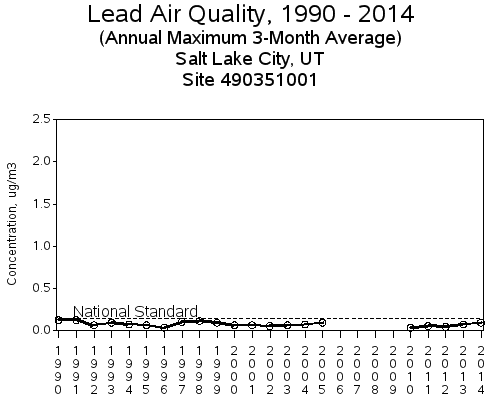 Between 1982 and 2005, the Utah Division of Air Quality (UDAQ) monitored lead air levels along the Wasatch Front; no violations of the former NAAQS were measured. Lead monitoring was restarted with the 2008 revision of the NAAQS. Due to a lack of current air monitoring data, all areas in the state are currently designated as unclassifiable for lead (UDAQ, 2014b). However, concentrations at the longest running lead monitor in Utah (located in Magna near the Kennecott smelter and refinery) have consistently been below the NAAQS (Figure 4).